By Lauryn on August 5th, 2013 . Filed under: Bakeries . Only two years ago, Jilly’s Cupcakes competed on Food Network’s Cupcake Wars and blew away their competition. In the time since winning, they have been hard at work expanding their business in a number of exciting and tasty directions. Turning several of their winning cupcake flavor combinations into a new line of ice cream is just one of the changes they have announced in the last few weeks. While some might be disheartened to learn that they are closing their Bar-a-go-go location in Des Peres, their cupcakes will instead be available in the Des Peres Schnuck’s bakery. And just a few aisles over from Jilly’s Everyday Delight Cupcakes, you will find those pints of Jilly’s Ice Cream. 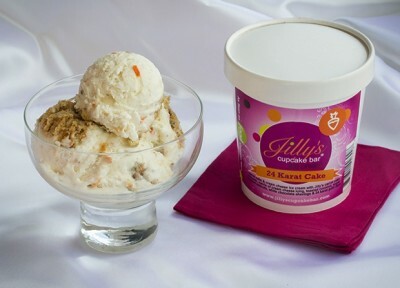 Four of their famous flavors have been blended into frozen treats for purchase, each carton complete with morsels of the original Jilly’s Cuban Coffee, 24 Karat Cake, Space Monkey, and Island in the Sun cupcakes and a swirl of their signature icings. These new ice cream flavors are also available at their St. Louis flagship location, Jilly’s Cupcake Bar and Café on Delmar Boulevard. More items have been added to the menu there than just the ice cream. They now offer lunch daily as well as a Sunday Brunch. 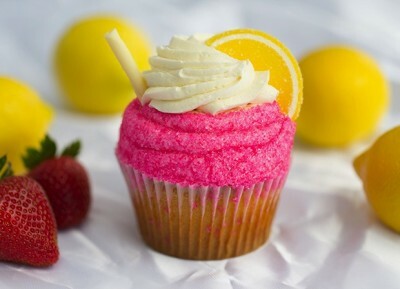 Jilly’s Cupcakes are also carried by several other stores in the St. Louis area. And a new month means new limited edition cupcakes. So for just the month of August, you could pair a scoop from one of their new ice creams with a strawberry lemonade, orange dreamsicle, peach melba, or German chocolate cupcake. « Is Your Cake Mix Leaving You with Fewer Cupcakes?